« Older: Who dropped the ball in the burial of Silvia Benitez? San Pedro Police found a significant amount of firearm cartridges in an empty lot in the Boca del Rio Area. 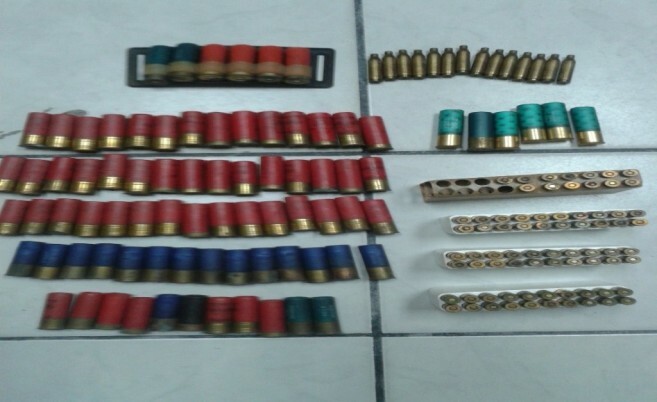 Police had received anonymous information on the location of a stash, and a search was carried out on Saturday, January 31st at around 1:30PM, where a total of 148 cartridges were recovered. Since the rounds were found in an empty area and no one was found in the immediate area, the cartridges were taken to the San Pedro Police Station where they were labeled as “Found Property”. Investigations are ongoing to determine the owner of the cartridges. According to the San Pedro Police, the cartridges found are commonly used as ammunition for rifles and shotguns. The stash contained 59 live Remington .243 centrefire cartridges, nine live 12 gauge Winchester cartridges, 11 live 12 gauge Remington Peters cartridges, 23 live 12 gauge Western SuperX cartridges, four live 12 gauge Eiley Grand Prix cartridges and 28 live 12 gauge Winchester Super speed cartridges. Also found were 14 expended Remington .243 centrefire shells, believed to have been used during a target test. Most of these cartridges are common in Belize, as the 12 gauge cartridges are used in shotguns commonly used in hunting game, home security and by law enforcement agents. Like with any other firearm and ammunition, shotguns and 12 gauge cartridges should be legally licensed in order to be used. These found cartridges were not licensed. The Remington .243 centrefire cartridges are used in high caliber rifles, also commonly used in hunting small game and target practice. Anyone with further information on the find is to call the San Pedro Police Department at 206-2022. To remain anonymous contact Crime Stoppers Belize at 0-800-922 –TIPS (8477).